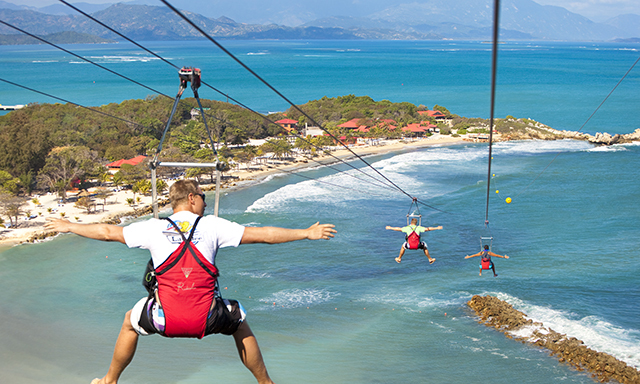 Test the tradewinds on Labadee's Dragon's Breath Flight Line. Your tour begins with a flight briefing and orientation. You'll test your mettle on the shorter "Little Dragon" flight line. You're then transported in custom-made safari vehicles to the take-off point 500 feet above the beaches of Labadee. Enjoy breathtaking views as you zip down a flight line more than 2,600 feet long at speeds of 40-50 mph. Your flight lands at Dragon's Breath Rock. • Dragon's Breath Flight Line: Soar over 500 feet above the beaches at speeds of 40-50 mph. • Flight Line Staff reserves the right to adjust minimum and maximum weight requirements due to current weather conditions at any time before or during the tour. • Guests with pre-existing neck, back, knee and/or shoulder injuries, cardiac conditions, asthma, diabetes, epilepsy, other heart or respiratory conditions or any other medical condition must take particular caution when selecting a tour - particularly tours categorized as "strenuous."